Release In 16 May 2011 And Only Limited Number Were Produced ! Diet Coke takes another stylish step into fashion this Spring by announcing its second fashion collaboration with international creative genius, Karl Lagerfeld. The world-renowned designer will create not one but three new and exclusive designs for the iconic Diet Coke bottle. 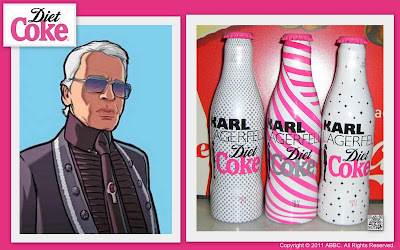 Exclusively available at Harvey Nichols and online at harveynichols.com from May 16th, the ‘Diet Coke Limited Edition Collection by Karl Lagerfeld’ is totally irresistible and is set to become the perfect accessory for style conscious women everywhere. Using the light and playful elements of his identifiable trademark style, such as graphic cuts, a contrasting black and white palette and clean lines broken with colour or detailing – Karl Lagerfeld has created a bold, contemporary yet instantly recognisable collection. For this collection, Karl Lagerfeld has taken inspiration from the new Diet Coke heroines; Bernadette, Eleanor and Irene, the stylish puppets will appear in the brand’s latest TV campaign launching across Europe. 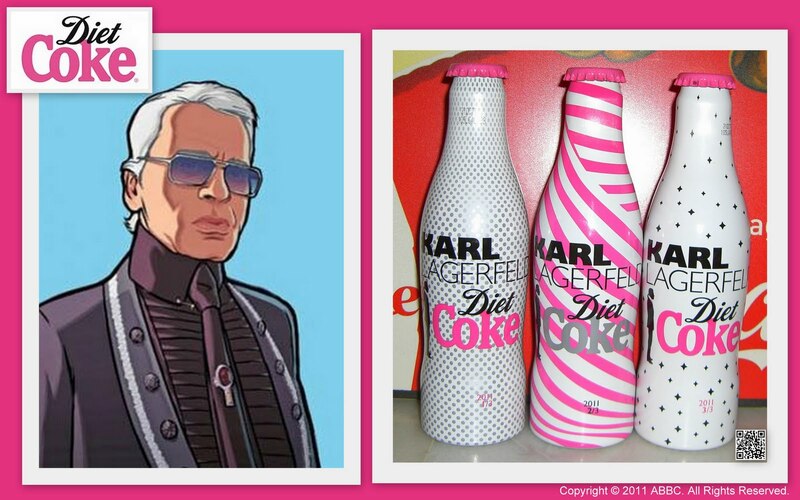 Karl Lagerfeld perfectly encapsulates the Diet Coke ‘lighter approach to fashion’. For this exclusive collection, he adds a playful and light dimension by capturing the humorous and fun personalities of each of the Diet Coke girls, through each of the bottles. The first design, inspired by Bernadette, is both romantic and modern - a chic polka dot pattern in brushed metal grey contrasts with glossy white. The second bottle is true fashion, bringing Eleanor’s personality to life with a strong vibrant pink swirl encircling the bottle. The third design, in-line with Irene’s rock chick personality, has a harder, more dramatic look featuring a bold stud pattern. All three designs feature Karl Lagerfeld’s famous and instantly recognisable silhouette – the designs are also numbered (1,2,3) which makes these beautiful bottles truly ‘must have’ collectibles. The ‘Diet Coke Limited Edition Collection by Karl Lagerfeld’ bottles will be available individually from Harvey Nichols for £1.95 each or as a set in an exclusive stylish prism-shaped Collector’s Box created by the designer, on sale for £9.95. As well as designing the collection, Karl Lagerfeld, already a reputable photographer within the fashion industry, has shot the Diet Coke advertising campaign featuring supermodels Coco Rocha, Heidi Mount and Jeneil Williams. Just like the bottles, each of these three supermodels has a distinct, individual look whilst working in perfect harmony together. Inspired by the Diet Coke girls, these models will bring to life the characters of the puppets and perfectly encapsulate the brand’s playful and fashionable spirit.